Builder: POM - Pécsi Orgonaépít? Manufaktúra Kft. 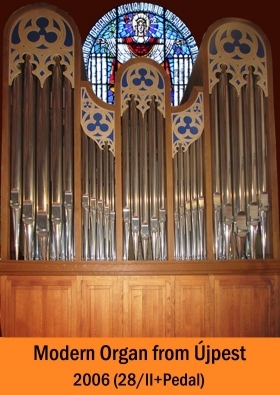 Description: Built in 2006, this mechanical action two-manual organ is a typical product of the Organ Manufacturing Company of Pécs. The coffered ceiling of this medium size modern church makes its acoustics quite dry. Nevertheless, this modern baroque organ sounds quite nice.